Facade of the Duomo (photo: Laura Cantero, CC BY-SA 3.0 license). 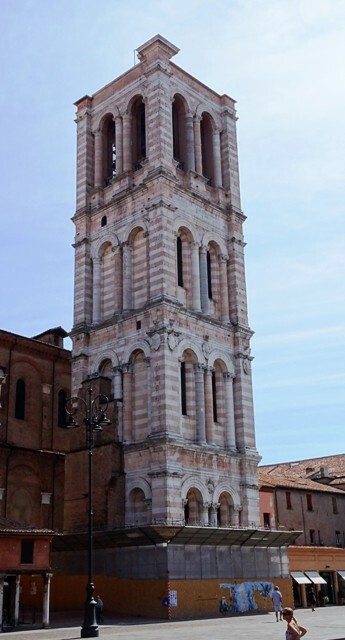 The cathedral of San Giorgio was consecrated in 1135. There is actually another church dedicated to San Giorgio in Ferrara. It can be found south of the river Po and used to be the original cathedral of the city. When the settlement on the northern bank grew in size and became much more important, the cathedral was moved to the other side of the river. This is the current cathedral. 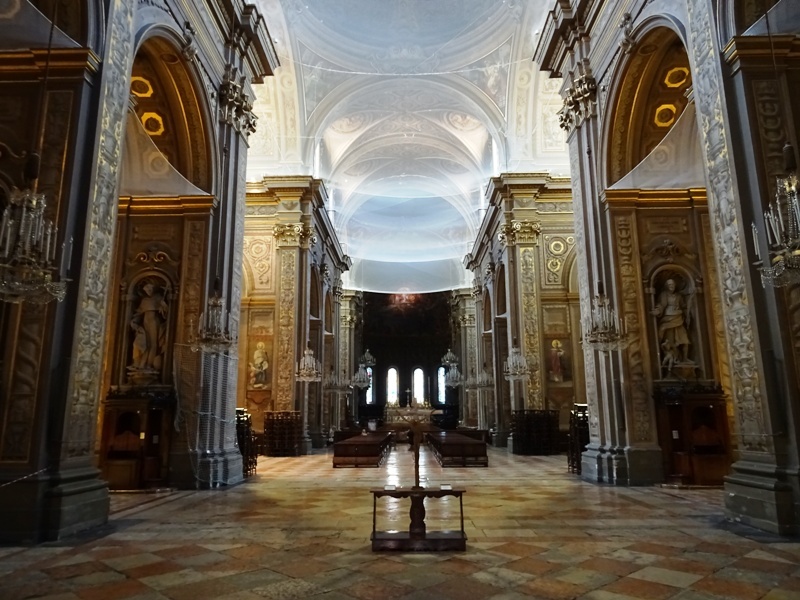 The former cathedral is now known as the church of San Giorgio fuori le mura as it is outside the walls of the city. One pope was interred in the Duomo: Pope Urbanus III (1185-1187), who died in Ferrara in 1187. Unfortunately his original tomb is no longer extant; it has been replaced with a fifteenth century cenotaph in the left wall of the choir. Not much of the original twelfth century cathedral has survived. The most authentic part is the facade, now regretfully hidden behind scaffolds. The lower part, in pink and white marble, is clearly Romanesque, while the middle and highest part are examples of Gothic architecture (note the pointed arches). Above the central portal is a lunette with a relief of Saint George slaying the dragon, attributed to a sculptor who is known as Nicholaus or Niccolò. Above the lunette we see a portico or loggia, which was added in about 1250. Inside are a Madonna and Child, while the frieze and tympanum have scenes from the Last Judgment. The month of September (Cathedral Museum). The south side of the Duomo is very interesting. Here we find the Loggia dei Merciai, the Loggia of the Merchants. This loggia has been used for all sorts of shops since the Middle Ages, and there is still a variety of shops here today. There used to be a portal in the south side of the cathedral as well, the Porta dei Mesi or Gate of the Months. It has been attributed to Nicholaus and Benedetto Antelami (ca. 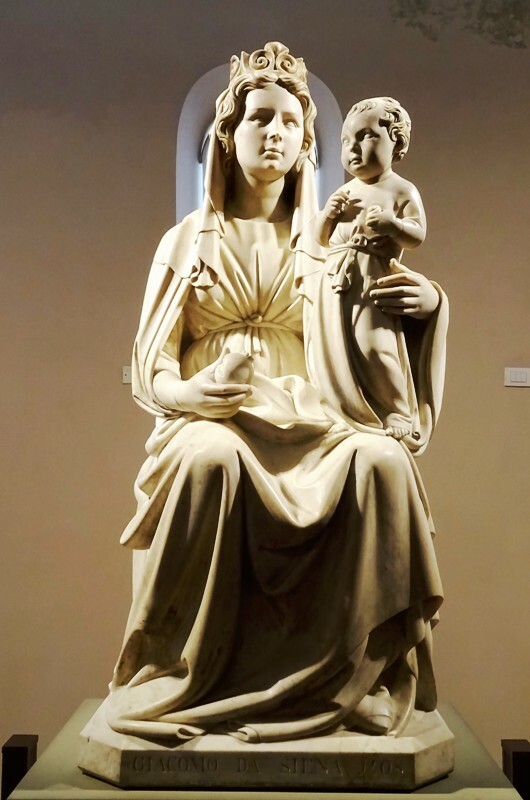 1150-1230) and featured statues representing the months by an unknown master. The Porta dei Mesi has unfortunately been demolished in the eighteenth century when the Duomo was completely renovated. The statues of the months can now be admired in the Cathedral Museum, which is just across the square (see below). Behind the Duomo we find the rather unimpressive campanile. It was executed in pink and white marble and looks rather nice, but it is much too short for a cathedral of this size. The campanile was built in the second half of the fifteenth century and is attributed to the Renaissance architect and noted polymath Leon Battista Alberti (1404-1472). For some reason – perhaps a luck of funds – the tower was never finished, which explains its diminutive size. Behind the Duomo we can also take a look at the huge apse of the building, which was designed by Biagio Rossetti (ca. 1447-1516), the architect who was also responsible for the Palazzo dei Diamanti elsewhere in Ferrara. Virtually nothing is left of the original Medieval interior of the Duomo. The building was given a Baroque makeover in the eighteenth century. As a result, the Duomo looks very modern on the inside. For some reason nets have been put in place in the nave and between the columns. 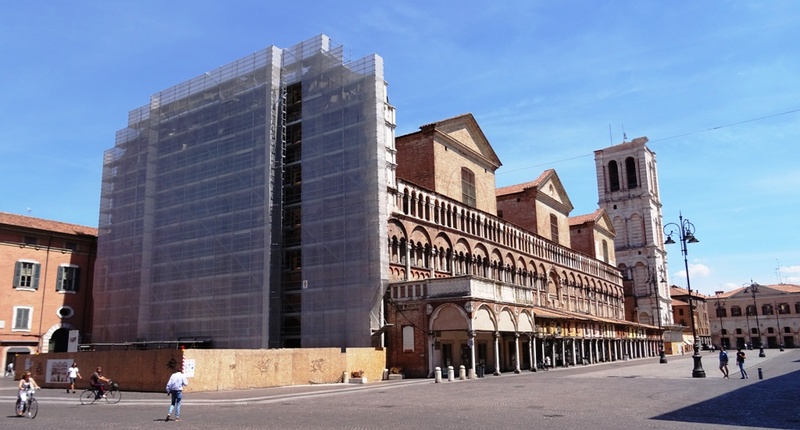 Their purpose is a mystery to me; perhaps they are somehow related to the restauration efforts, perhaps the stucco work of the ceilings is coming off – there was an earthquake in Ferrara in 2012 – or perhaps it has something to do with pigeons invading the cathedral. Since I am not a big fan of Baroque art, I thought the art inside the Duomo, though opulent, was not very impressive. The painting of the Martyrdom of Saint Lawrence by Guercino (1591-1666) was good though. 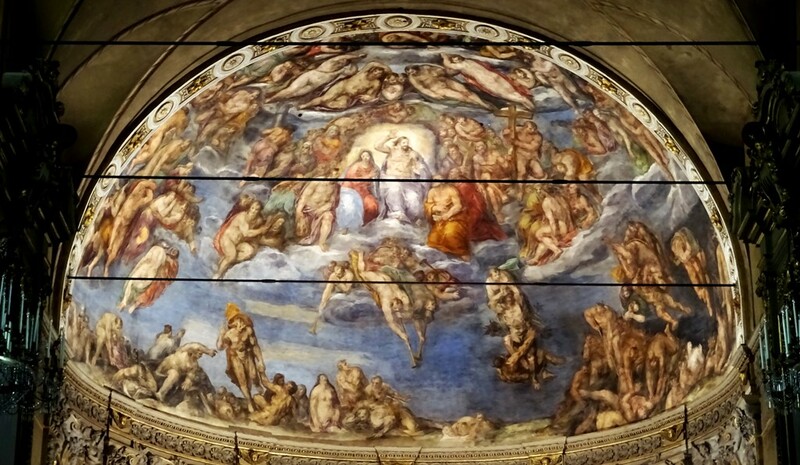 The best part of the Duomo is obviously the huge fresco of the Last Judgment in the conch of the apse. It was painted between 1577 and 1581 by a local artist named Sebastiano Filippi, who went by the moniker Bastianino (ca. 1528-1602). To fully enjoy the fresco, you will need to switch on the lights, which will cost you two Euros. Bastianino’s work is certainly not brilliant, but it is very interesting nonetheless, especially because it was clearly inspired by Michelangelo’s Last Judgment in the Sistine Chapel in Rome (painted 1536-1541). The Cathedral Museum can be found in the former church of San Romano, located on the other side of the Piazza Trento-Trieste. One part of the museum is housed in the former cloister, the other in the deconsecrated church itself. 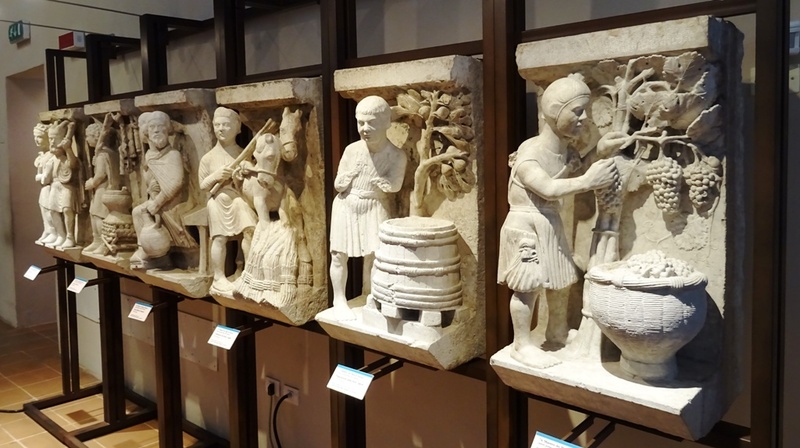 Several objects from the Medieval cathedral can be found here, for instance the statues of the months from the Porta dei Mesi. These early thirteenth century statues (ca. 1225-1230) are of great quality. 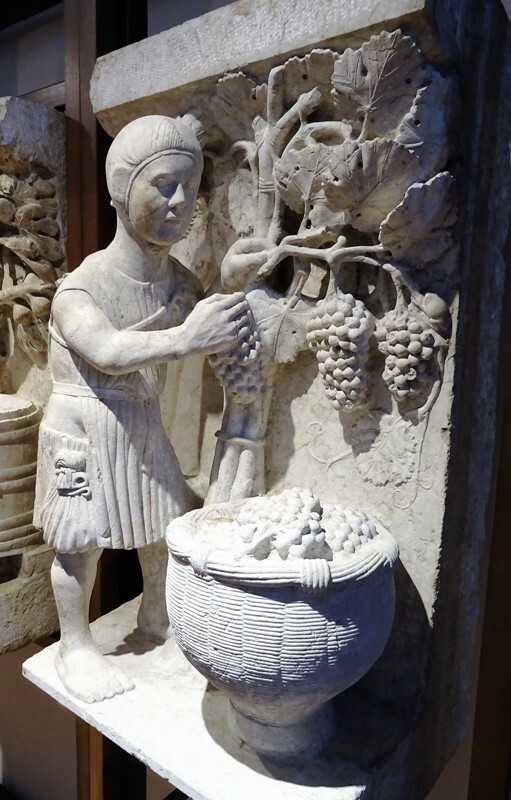 Take a look at the statue of September (see the image above), the traditional month of the grape harvest and wine making. We see a man picking the grapes and putting them into a wicker basket. He has bound up his tunic so that his legs are bare. Perhaps this is so that he can move more freely or because he will start stomping the grapes with his feet after the picking. In any case, the details are fantastic: the relief of the wicker basket, the veins of the leaves of the grapevine, the tunic of the man and the cap he is wearing. The sculptor – identified as the Master of the Months of Ferrara – must have taken his time. In 1438, an important church council was held in Ferrara to bring about a reconciliation between the Roman Catholic and Eastern Orthodox Churches. It had been organised by Pope Eugenius IV (1431-1447) and the delegation from the East comprised the Eastern Roman emperor himself, John VIII Palaiologos, the patriarch of Constantinople and some 700 others. After several sessions and few results, the council was moved to Florence in 1439. The official reason was an outbreak of plague in Ferrara, but the real reason seems to have been of a financial nature. The discussions had been dragging on for eight months and the Pope was fed up with having to pay for everything. The Florentine leader Cosimo the Elder (1389-1464) was more than willing to cover all the costs, and this was probably the decisive factor in the decision to transfer the council to Florence. In any case, one of the delegates from the Eastern Orthodox Church was a brilliant scholar named Basilios Bessarion (ca. 1403-1472). He was the metropolitan of Nicaea and played an important role during the Council of Ferrara and the subsequent Council of Florence. On 5 July 1439 a Decree of Unity was signed and then read out in the Duomo of Florence. It was Bessarion who read out the Decree in Greek. The Churches of the West and of the East had now formally been united, but the whole project came to nothing when the Decree was rejected by Constantinople the next year. Bessarion decided to stay in Italy. He converted to the Catholic faith and became a cardinal. He could even have become Pope, but his Greek background worked against him. The cardinal introduced Italy to the Greek language, Greek literature and Greek philosophy again, especially Plato. He had an extensive library full of Greek manuscripts which he donated to the Venetian state in 1468. 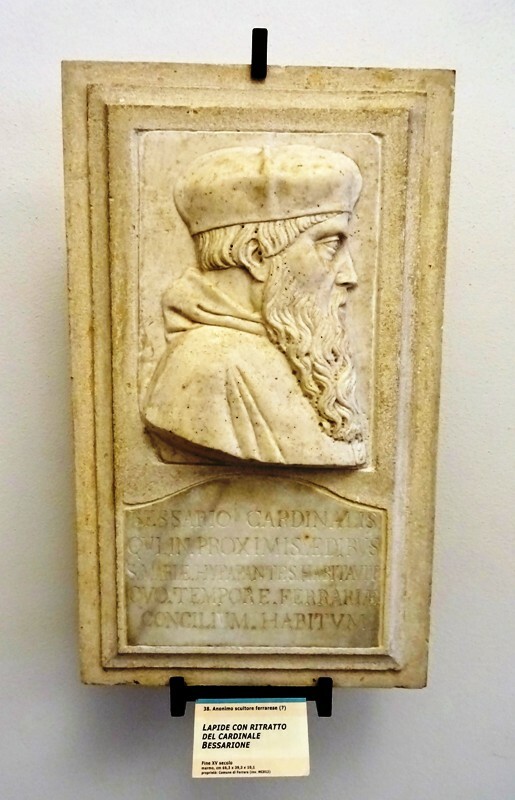 The Cathedral Museum of Ferrara has a relief featuring his portrait. The Latin text refers to his stay in the city during the Council of Ferrara (Ferrariae concilium). 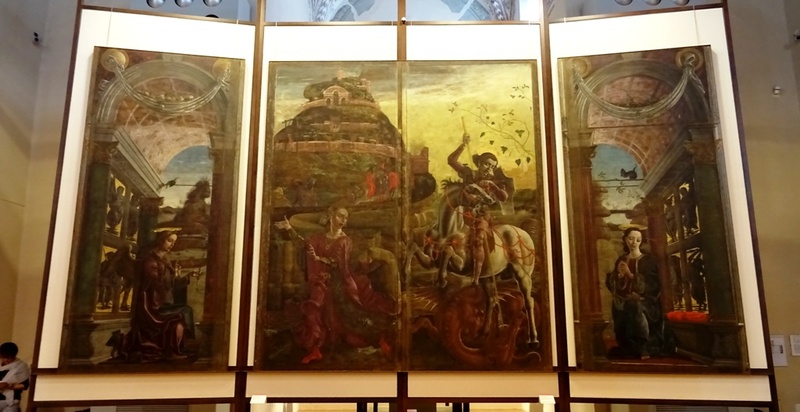 Finally, the Cathedral Museum has an interesting set of organ panels which were painted by one of the most famous Ferrarese painters, Cosmè Tura (ca. 1433-1495). The central two panels have a scene about the legend of Saint George and the dragon. Saint George – San Giorgio – is the patron saint of Ferrara and the Duomo is also dedicated to him, as has already been mentioned above. The panels on the left and right together form a scene of the Annunciation, with the left panel featuring the archangel Gabriel and the panel on the right the Virgin Mary. Organ panels by Cosmè Tura. 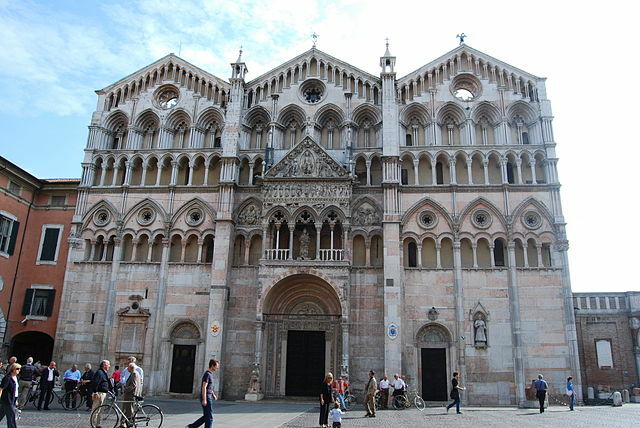 For more information about the Duomo and Cathedral Museum, you can visit the official website of Ferrara (here, here, here and here), while Italian Wikipedia has a good article about the Duomo as well.